50 Dosh Code For Bin Tycoons on Bin Weevils! If you’re not a Bin Tycoon, no worries! There’s still time to become a Bin Tycoon.. maybe you could put it onto your Christmas wishlist and you never know, it may appear in your Christmas stocking one morning.. as if by magic. There’s so much you can do as a Bin Tycoon, we’ve listed a few features here. Weevily wow, do you want to have more space in your nest to buy all the awesome nest items that you want? Become a Bin Tycoon and weevil on over to the Shopping Mall and visit Rigg’s Property Shop! Do you want your very own cute cuddly Bin Pet for yourself? I’m sure you do, I don’t know anyone who doesn’t want a Bin Pet! Become a Bin Tycoon and weevil on over to Bin Pets Paradise and visit the Bin Pet Shop! Do you want to level up and earn Mulch faster on Bin Weevils? Or maybe you just want to plant more pretty plants! Become a Bin Tycoon and weevil on over to the Shopping Mall and enter Garden Plots! We have featured some of the benifets you will receive when you become a Bin Tycoon on this post! To see even more befifets, visit the membership page, by clicking the image above! Sorry for the late post on day six, for the Bin Weevils advent calender, Yoshi has been really busy with Christmas, so I’m currently here to cover for him. Are you sitting in front of a nice warm fire? Are you on Bin Weevils? Why not go to the advent Calender in your nest and search for number six and seven! If you’re a little stuck where number six and seven are, then here they are. If you’re a Bin Tycoon and missed number six, you can get still get it, sadly non-tycoons can’t. However, number seven, you have today to go grab the item’s shown below. Thanks for reading, check back tomorrow for more prizes from the advent calender! Brand New In-Game Dosh Earning Feature! It’s Update Friday! Can you guess what update has appeared on Bin Weevils today? A brand-new feature to earn Dosh coins – this will be especially useful for Weevils, who don’t receive a monthly Dosh salary. I’ve seen this in a few MMO games and I think it’s great that Bin Weevils have added it to their game. Wondering how it works? This feature is very simple indeed to use! Simply login to Bin Weevils, click the video icon (example shown above) and a video will start playing. It’s usually only two or three minutes and when it’s finished, you’ll get a reward of Dosh.. Bin-tastic! Here’s a screenshot of what the video screen looks like. Want to have YOUR Dosh’s Palace Design Displayed? The richest Bin Weevil in the Bin, Dosh, likes to have his palace decorated every year, to celebrate Easter! Why not help Dosh out, by creating a design and submitting it to Bin Weevils? A weevily big congratulations to last years grand prize competition winner, geisha-girl, who got to have her winning design displayed at Dosh’s Palace! Just think, your design might be featured this year. As qouted above, last year’s winning design was totally Bin-briliant! Could you draw the most Bin-tastic Easter Egg design of all? Download the printable PDF template to get started! Paint, colour and glitter your way to the most amazing Palace ever! The whole team here at Bin Weevil Company would like to wish you all a Happy Easter Holidays! The Easter Party should be arriving on Bin Weevils soon. P.S Remember not to eat too many easter eggs! Bin Weevils Mag #25 OUT NOW! It’s the moment you’ve all been waiting for, you’ll all get to see Lab’s pictures from his journey to the past, inside the latest issue of the Bin Weevils Magazine, which has just hit all good stores today! Inside the latest edition of the Bin Weevils Magazine, there’s some one use only codes, for 5000 Mulch and 10 Dosh! 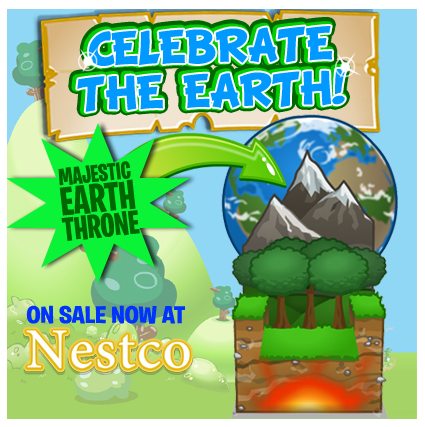 There’s also two codes inside the magazine for some Bin-tastic nest items, which will look awesome in one of your nest rooms! But wait, there’s even more awesome things inside the Bin Weevils Magazine! This time, not virtual items, but real items! You can get… Clott’s Eyeball Glasses, Bin Weevils erasers and a Big Bin Weevils Survey! Why not pop-along to the Bin Weevils Magazine website, where you can have a little sneak peak of what is inside this new, Bin-tastic issue! There’s also a newish game on the website, which is fun to play! Want to win a 10 Dosh Code? Here’s Your Chance! This competition is currently closed for this month due to Tink’s Takeover. You’re first to hear this… more info coming soon! It’s really simple to enter our monthly Dosh competition! All you have to do, is email hf556.binweevils@outlook.com with your Bin Weevil name and you have a chance of winning a 10 Dosh code! It’s really that quite simple. Here at Bin Weevil Company, we do a 10 Dosh competition every month! So that means that if you don’t win one month, you always have a chance to win in the upcoming month! Please note: you’ll have to re-enter each month! 10 Dosh Code Winner March 2014! There has been some confusion with how to enter the competition. You just need to send an email to hf556.binweevils@outlook.com and include your Bin Weevils username!